Like many things in investing and personal finance, the answer is, "it depends". For decades, retirement planners and financial advisors have recommended the "4% rule" as a way to make retirement savings last for decades. But with interest rates so low, people living longer, and rising healthcare costs, it's not so clear anymore whether the 4% rule still makes sense. Let's take a closer look at the 4% rule and the key factors that affect whether it will work for you, or not. In short, it's a basic guide for how much a retiree should withdraw each year from their retirement savings, developed by a financial planner named Bill Bengen in the early 1990s. The idea behind the 4% rule is simple: By starting with a withdrawal of 4% of your retirement account balance, and then increasing that amount by inflation each year, the average retiree should be able to count on sustainable income for decades, and not run out of money in old age. The rule was based on having a mix of both fixed-income investments such as bonds, and long-term growth assets such as stocks, to generate interest, dividends, and capital gains to offset the withdrawals taken each year. 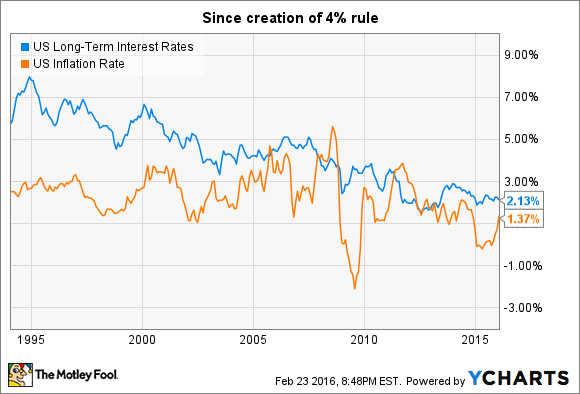 Current interest rate environment means much lower fixed income to offset withdrawals. People are living longer, needing more money in retirement. People need more care later in life, when retirement account balances will be lower and the spending power of that money will have weakened. According to the Transamerica Center for Retirement Studies' 2015 annual Retirement Survey of Workers, the median estimated retirement savings for people in their 60s was $171,000. Based on the 4% rule, that would generate approximately $6,840 per year in income, before inflation increases. According to the Social Security Administration, the average Social Security retirement benefit was $1,363 per month in December 2014. In other words, average Social Security and median retirement savings combine for $23,196 per year. For the majority of Americans, that's not enough. Since Mary is the most common women's name in the U.S. and John is the most common man's name, let's call our typical retiree "MJ." For MJ, there's a bigger potential problem than just not getting enough income using the 4% rule: Not having enough money in old age for long-term care. Interest rates are finally set to start climbing again, but it will be years before bonds and other fixed income instruments return to historical average yields, and current yields may not even keep up with inflation. This is troublesome for MJ, but it's only the start. It doesn't generate enough "today" income. It could leave MJ with too little savings for things such as increased healthcare costs and long-term care late in life. Here's a rough calculation. Let's say MJ invests half the portfolio in relatively lower-risk stocks, and the other half in bonds and CDs, and the stocks generate 5% annual returns on average, while the bonds and CDs pay about 2% yield today (but that amount goes up about 5% per year on average as interest rates return to normal). Based on that scenario, MJ would still have about $142,000 at age 80. Not bad, right? Except that's in 2016 dollars. Based on historical inflation rates, the spending power will probably be less than $100,000 in today's dollars. If MJ were to take out more than 4% per year -- say 5% -- that would cut the nest egg down to about $42,000 in 2016 dollars. Is that not enough money at 80? It may be, but the issue is that MJ will need more care in old age, and Medicare won't pay for a lot of things. For instance, if MJ falls and breaks a shoulder, Medicare would cover treatment, including rehab -- even a short stay in a rehab facility . But if MJ has problems getting dressed, or cooking, or with other daily living activities afterward, Medicare isn't going to pay for someone to help with those things. Depending on where MJ lives, it would cost over $40,000 per year today have in-home care to help with things such as cooking, cleaning, bathing, and getting dressed. If MJ were to need to move into a nursing home, the cost could exceed $50,000 to $90,000 per year, and again, Medicare won't pay for that. Furthermore, those are the costs today. Fast-forward 15 years, and it's going to cost a lot more. Hopefully MJ has other assets, such as home equity, to help pay for these costs later in life. What should MJ -- or you -- do? While retirement should be a chance to enjoy the fruits of your labors, you have an advantage in your early retirement years that you may not have when you get older: the ability to continue earning money. And considering that many retirees have trouble finding things to keep them active and engaged, and often struggle with adjusting to retirement life, it may be good for your financial and emotional well-being to continue working in retirement. Even working a couple of days a week could produce enough income to allow you to put off dipping into your nest egg for a few years, and that could make a huge difference as you age. Or to put it another way, slowing down may be a better idea than stopping, at least early in your retirement. If you're like MJ, and the retirement account balance you're starting from isn't enough for the 4% rule to give you enough income today and also preserve cash for later in life, you probably need to keep generating some income early in retirement. This could save you financial hardship when work isn't a possibility and you may need to pay for expensive care. If you're still years away from retirement and MJ's scenario looks familiar, the smartest thing you can do today is crank up your retirement savings while you still have time. 4% rule or otherwise, the number one factor in the quality of your retirement will be how much you have saved when you get there.